Easter-time and early spring in particular are full of wonderful things. We break open the windows and doors and step outside of our four walls into the sunshine again. We see nature’s buds pop up from the recently frozen and snowy earth. We convene with chickadees and cardinals and the lilacs infuse the air with freshness. Sure, the ants and mosquitoes begin their rallying for the summer as well, but to me this time of year is a nature-induced reminder of hope and joy. there as his attention was pulled elsewhere. Later in the afternoon someone drove their car right over the pile of chalk eggs, snapping and shooting out chalk colored dust as the wheels crunched over them. We all looked on in horror. Easter Morning 1980 something – my sister, brother and I were up and raring to go for our Easter egg hunt and the Easter Bunny had kindly hidden dozens of small chocolate eggs around the house. My Buppy was over to watch the festivities and had secured his favorite spot in the corner of the livingroom couch with his legs tucked up under him. Unbeknownst to us, the Easter Bunny had hidden an egg on the rim of Buppy’s glasses, next to his temple, and he sat with the utmost patience and stillness; a smirk on his face for a good 20 minutes while we searched all around him. 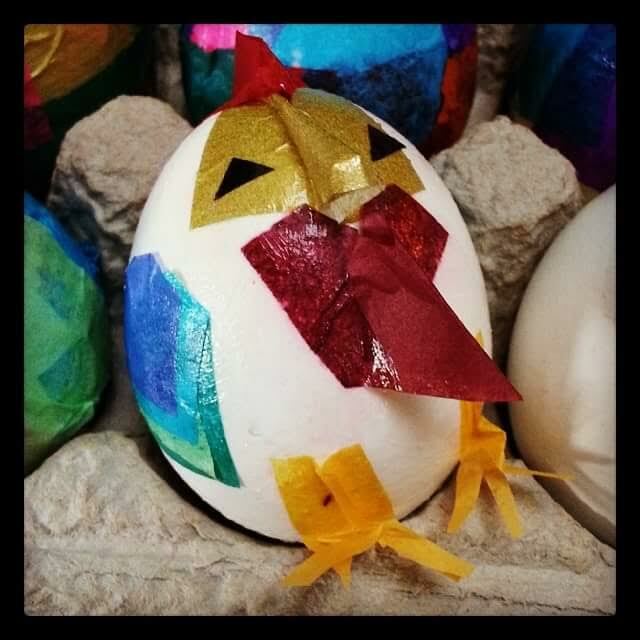 The raucous laughter that poured out of him when we finally found that sneaky egg is one of my fondest memories and was one of his as well – so much so, that when I went to see a medium once she shared an image of a grandfather signaling something to her by fiddling with his glasses and making a big hearty laugh. And here we are, almost at Easter and real Spring. No wonder my Nana used to love watching the spring birds outside her window so much – hope and joy. I am feeling hopeful for better things to come and taking joy in moments in the backyard with my girls, relishing in how they make me laugh. Every so often a red cardinal, my Nana’s favorite bird, drops in and I can feel her enjoying it with me. I’m Jen Hollidge, a full-time program coordinator, full-time mother of two amazing daughters and full-time wife to my partner in crime for 18 years. We live in Concord, N.H. I have an English degree from the University of New Hampshire and I love to write.